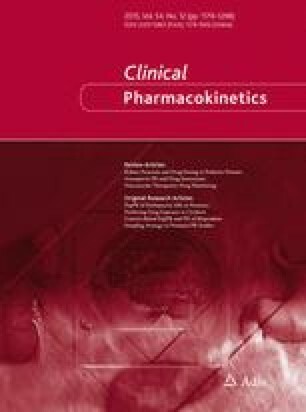 The use of an opportunistic (also called scavenged) sampling strategy in a prospective pharmacokinetic study combined with population pharmacokinetic modelling has been proposed as an alternative strategy to conventional methods for accomplishing pharmacokinetic studies in neonates. However, the reliability of this approach in this particular paediatric population has not been evaluated. The objective of the present study was to evaluate the performance of an opportunistic sampling strategy for a population pharmacokinetic estimation, as well as dose prediction, and compare this strategy with a predetermined pharmacokinetic sampling approach. Three population pharmacokinetic models were derived for ciprofloxacin from opportunistic blood samples (SC model), predetermined (i.e. scheduled) samples (TR model) and all samples (full model used to previously characterize ciprofloxacin pharmacokinetics), using NONMEM software. The predictive performance of developed models was evaluated in an independent group of patients. Pharmacokinetic data from 60 newborns were obtained with a total of 430 samples available for analysis; 265 collected at predetermined times and 165 that were scavenged from those obtained as part of clinical care. All datasets were fit using a two-compartment model with first-order elimination. The SC model could identify the most significant covariates and provided reasonable estimates of population pharmacokinetic parameters (clearance and steady-state volume of distribution) compared with the TR and full models. Their predictive performances were further confirmed in an external validation by Bayesian estimation, and showed similar results. Monte Carlo simulation based on area under the concentration–time curve from zero to 24 h (AUC24)/minimum inhibitory concentration (MIC) using either the SC or the TR model gave similar dose prediction for ciprofloxacin. Blood samples scavenged in the course of caring for neonates can be used to estimate ciprofloxacin pharmacokinetic parameters and therapeutic dose requirements. We thank the UK National Institute for Health Research for supporting the delivery of the ciprofloxacin trial, and the clinical teams at Liverpool Women’s National Health Service Foundation Trust (NHS FT) (Tim Neal, Christine Chesters) and Alder Hey Children’s NHS FT (Sarah Mahoney, Stephane Paulus), Liverpool, UK. This work was supported by the TINN (Treat Infections in NeoNates, European Commission FP7 project, Grant Agreement Number 223614), the GRIP (Global Research in Paediatrics, European Commission FP7 project, Grant Agreement Number 261060), and The Fundamental Research Funds of Shandong University. Stéphanie Leroux, Mark A. Turner, Chantal Barin-Le Guellec, Helen Hill, Johannes N. van den Anker, Gregory L. Kearns, Evelyne Jacqz-Aigrain, and Wei Zhao declare no conflicts of interest relating to this work. All procedures in this study were in accordance with the 1964 Helsinki declaration (and its amendments). The study was approved by the institutional ethics board and independent ethics board of the TINN project (EudraCT 2010-019955-23), and was also monitored by an independent safety monitoring board. Parental written consent to participate was obtained. European Medicines Agency, Committee for Medicinal Products for Human Use. Guideline on the investigation of medicinal products in the term and preterm neonate. Available at: http://www.ema.europa.eu/docs/en_GB/document_library/Scientific_guideline/2009/09/WC500003754.pdf. Accessed Aug 2014. Ethical considerations for clinical trials on medicinal products conducted with the paediatric population. Available at: ftp://ftp.cordis.europa.eu/pub/fp7/docs/ethical-considerations-paediatrics_en.pdf. Accessed Aug 2014. US FDA, Center for Drug Evaluation and Research. Guidance for industry: general considerations for the clinical evaluation of drugs in infants and children. Available at: http://www.fda.gov/downloads/Drugs/GuidanceComplianceRegulatoryInformation/Guidances/ucm071687.pdf. Accessed Aug 2014. US FDA. Guidance for industry: exposure-response relationships—study design, data analysis, and regulatory applications. Available at: http://www.fda.gov/downloads/Drugs/GuidanceComplianceRegulatoryInformation/Guidances/ucm072109.pdf. Accessed Aug 2014. European Medicines Agency, Committee for Proprietary Medicinal Products (CPMP). Points to consider on pharmacokinetics and pharmacodynamics in the development of antibacterial medicinal products. CPMP/EWP/2655/99. Available at: http://www.ema.europa.eu/docs/en_GB/document_library/Scientific_guideline/2009/09/WC500003420.pdf. Accessed Aug 2014. European Medicines Agency, Committee for Medicinal Prodcuts for Human Use (CHMP). Guidance on evaluation of medicinal products indicated for treatment of bacterial infections. CPMP/EWP/558/95 rev2. Available at: http://www.ema.europa.eu/docs/en_GB/document_library/Scientific_guideline/2009/09/WC500003417.pdf. Accessed Aug 2014.